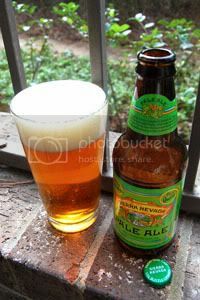 One of the key beers in the American craft-brewing movement, and the flagship brew of one of it's most iconic brewers, Sierra Nevada Pale Ale is one of the most important beers on the shelf today. It has served as a gateway beer for many budding hopheads and as the savior of many forced to buy their beer from countless grocery stores and gas stations. It even helped define its own style, the American Pale Ale. Sierra Nevada describe their Pale Ale as a "delightful interpretation of a classic style [with] a deep amber color and an exceptionally full-bodied, complex character." The malt backbone is composed of Two-Row Pale & Caramel varieties, Magnum & Perle hop varieties are used for bittering, and Cascade hops are used for dry-hoping. Sierra Nevada Pale Ale has won countless awards, including seven gold medals at the Great American Beer Festival. Appearance: A clear, brilliant golden orange body with millions of particles suspended within. On top, a bubbly white head that leaves above average lacing. Aroma: Gloriously bright, citrusy Cascade hops over a sweet malt backbone. Mouthwatering, to say the least. Taste: Decently bitter Cascades up front, in just the right proportion for a Pale Ale. A solid caramel-biscuity malt base keeps everything in perfect balance. Little hints of booze from time to time. Near perfect proportions. Mouthfeel: A medium body with moderate carbonation. Very refreshing. Drinkability: Amazingly quaffable, I could run through a six-pack of this without even realizing it. Verdict: Simply brilliant and perfectly balanced, there's no wonder why this has become the classic American Pale Ale. Like Anchor Steam, Sierra Nevada Pale Ale is one of the great forefathers of the American craft-brew world that still holds up to anything brewed today. I think this beer is terrible, but I still like your review. The only Pale Ale I like better is New Holland's Mad Hatter. It is strangely familiar to Sierra Nevada, but the hops are less brassy and have a cleaner finish. I definitely agree with the drinkability: it's swift but not subtle, and the flavors play at a mezzo-forte.